Heritage for Peace has had a very active year in 2014. On November 23, Daniel Shoup presented Heritage for Peace’s work and participated in the panel discussion at the American Schools of Oriental Research’s Syrian Heritage Initiative meeting in San Diego, California. In attendance were over 100 heritage scholars and activists. Heritage for Peace has been involved in other international conferences, training programs, and awareness-raising events.This newsletter was also initiated in February of this year. Visit the Press Release page to peruse the activity of Heritage for Peace over 2014. In addition, Heritage for Peace published two detailed summaries of international response to the Syrian crisis (links to which are found here). Many thanks to the members, volunteers, subscribers, and supporters who have worked so hard towards peace for Syrian people and their heritage. The American Association for the Advancement of Science offers a new update on damage (17 December 2014) discussing damage to Ebla, Mari, and Dura Europos, with photographs, here. DGAM issued an update (11 December 2014) to damage in the Deir Ez-Zor region for the month of November. The bulletin reveals that illegal work at Mari, Dura Europos, Zenobia and others has been continuing, although it also claims that work at the latter two has been stopped. Some sites are unreachable, presumably because of activity by IS. See the chart here. 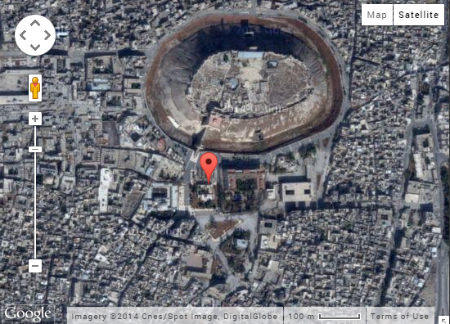 The DGAM (7 December 2014) reports an explosion in Aleppo near the 800-year old Al-Sultaniah/al-Sultaniya mosque here. No further details are available. Protect Syrian Archaeology has shared a photograph showing the destruction of part of it here. A photo by Ismael Abed- Alrahman shows damage to Al-Mydani Mosque, Bab al-Nasser/Bad al-Naser on November 30, 2014, shared by Protect Syrian Archaeology here. On December 2, 2014, the DGAM reported a ‘massive blast’ in the ancient city of Bosra, close to the al-Omari mosque (here). On December 11, the DGAM updated this report, stating that only one house had been destroyed, found here. The DGAM reports that looting has decreased in Ebla and other sites in Idlib from a decreased in foreign presence for theft and greater community efforts to protect local heritage. The museum at Maarat al-Nu’man has also been protected. See the brief here. However, the AAAS report (mentioned above) indicates that looting has gotten worse as well, and shares before-and-after satellite images here. The DGAM reports on December 19 that the Homs detachment has been able to resume work in the heavily damaged city The team is now focusing on local restoration work and is engaged in checking the status of sites around the city, which they report at the moment to be by and large in good condition. See the report here. The DGAM participated in the international conference ‘Cultural Heritage in Danger’, which took place on December 11 and 12 in Berlin. The conference was sponsored by The German Archaeological Institute, the Prussian Cultural Heritage Foundation and the German Archaeological Association. Along with the DG of the DGAM, Dr. Maamoun Abdulkarim, his Iraqi and Egyptian counterparts were also in attendance (Ahmed Kamil and Mamdouh Mohamed Gad El Damaty, respectively). At the conference, delegates recommended that the international community work strengthening border controls, supporting local and national institutions, training archaeology specialists to work with customs inspectors, and other initiatives. See the report here. The DGAM participated in the UNESCO-sponsored event ‘Protection of Cultural Heritage & the Respect of Cultural Diversity in Iraq and Syria’ which took place in Paris on December 3, 2014. An early announcement is here and a more detailed one can be found here.The meeting ‘focused on how to combat the smuggling of antiquities, the international actions that could help to fight the illicit traffic of cultural property, and the laws and the international conventions for the protection of cultural heritage.’ Speakers included UNESCO DG Irina Bokova, the UN Special Envoy for Syria, Staffan de Mistura, and the DG of the DGAM, Dr. Maamoun Abdulkarim. Dr. Abdulkarim’s speech addresses the vision of the DGAM – to make all Syria share in and take responsibility for its heritage, to protect it and to defend it. Saving Antiquities for Everyone (SAFE) on December 6 2014 published a statement (here) supporting recent US efforts to address cultural heritage protection in Syria and Iraq, carried out via the ‘Protect and Preserve International Cultural Property Act’ which can be found here. The American Association for the Advancement of Science has an updated website dealing with damage to sites in Syria. The site has comprehensive analysis of destruction of a number of prominent sites, along with a range of detailed photographs, and can be found here. ASOR also continues to publish weekly reports, the most recent of which can be found here. The New York Times (December 17, 2014) runs an article entitled “The Destruction of Syria’s Patrimony” The article highlights the recent UNESCO meeting in Paris, designed to address trafficking, looting, and ongoing destruction. Der Spiegel (December 10, 2014) runs an article “Dubious Provenance: Pressure Grows for Museums to Return Stolen Objects” by Konstantin von Hammerstein writes about the pressure to return looted antiquities to their rightful owners. Deutsche Welle (December 12 2014) says “Germany to crack down on antiquity theft” The article suggests that Germany, apparently a major venue for trading stolen artefacts, is seeking to reduce the market in an attempt to stem the tide. Hyperallergic published an article by Sam Hardy (of Conflict Antiquities), “UN Maps Reveal Destruction of Thousands of Cultural Sites Across Syria“, addressing the use of satellite imagery to document damage to sites in Syria. According to such data, over 31,000 sites in Syria alone have been damaged during the ongoing conflict. The UNESCO Conference in Paris in which the DGAM participated (see above) is branded as ‘too little too late’ by IsraelNationalnews.com (December 7 2014). The Huffington Post runs an article on December 6 2014 entitled ‘Congressional Monuments Men? The Role of Congress in Fighting Terrorist Financing, While Preserving Our Cultural Heritage’. As the title suggests, the author invokes the legacy of WWII’s ‘monuments men’ as an example of US leadership in the preservation of world heritage, and the author urges Congress (and governments everywhere) to take a leadership role in protecting the cultural heritage of Iraq and Syria. Copyright © 2014 Heritage for Peace, All rights reserved.